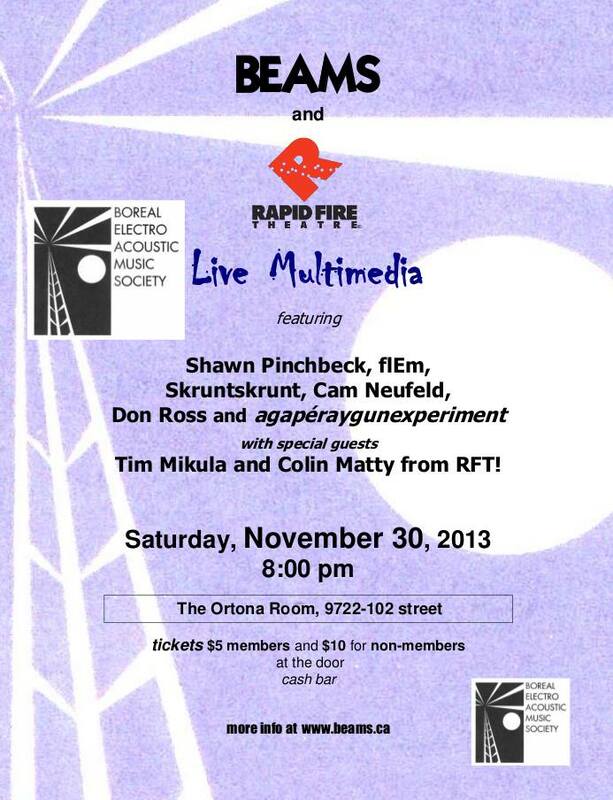 Rapid Fire Theatre improv actors Tim Mikula and Colin Matty will adapt their madcap physical theatre to the surreal soundscapes of works by St Crispin’s Improv, Skruntskrunt, fl3m and agapéraygunexperiment for this unique one-nighter. Sound artists Don Ross, Cam Neufeld, Shawn Pinchbeck, Gene Kosowan, Abram Hindle, Phil Jagger and more will use tech high and low, including motion detectors, kinect depth sensor camera, projectors, synths, loopers, kaoss pad, clarinet, violin and bass. The show features cabaret seating and bar. Admission is $10 at the door, $5 for BEAMS members. For more information, go to www.beams.ca or write to info@beams.ca . Gary James Joynes is a dedicated audio and visual artist, composer, musician, vocalist, and sound designer from Edmonton, Alberta. As Clinker, he explores the ever-evolving language of technology through electronic composition. In recent years, Joynes has produced several notable audio-visual works, including “On the Other Side… “, a live-cinema piece commissioned by the 2008 International Leonard Cohen Festival . The sound elements of his 2008 live-cinema were then re-composed into Clinker’s most recent audio work entitled “On the Other Side…(for L. Cohen)” released by Dragon’s Eye Recordings in 2009. In 2008 Clinker composed his first experimental film score for “Dirt “, a feature-length documentary produced by the National Film Board of Canada . He has appeared 3 times before at Mutek 2003, Mutek LePlacard 2005 and in 2007, with his live-cinema performance piece “Provody” . At MUTEK_10, he will reprise his Leonard Cohen tribute “On the Other Side… ” for the city that is home to the author and chanteur. This work explores Cohen ’s continued romance with the chiaroscuro of the human experience by creating an audio-visual deep listening environment that draws from the words and voice of Leonard Cohen. The lush bass tones of Cohen’s voice provide a point of departure for a journey of sound and light, as Clinker deconstructs and reassembles Cohen’s voice into specially designed sub-sonic frequencies. The kickoff concert cascades from themes and content explored earlier in the day. Interspersed with screen work presentations, the evening explores performative manifestations of image and sound. Video by: Dominique Skoltz (y2o), Robin Dupuis (Lixiviat), Yan Breuleux (Tempêtes), and Maxime Corbeil-Perron (Ghostly) – and live audiovisual performances by Clinker with Peregrination, Blur rouge from Manuel Chantre, Le Révélateur, and Bardos by Sean Caruso.